Is it fair to say the second time’s the charm? 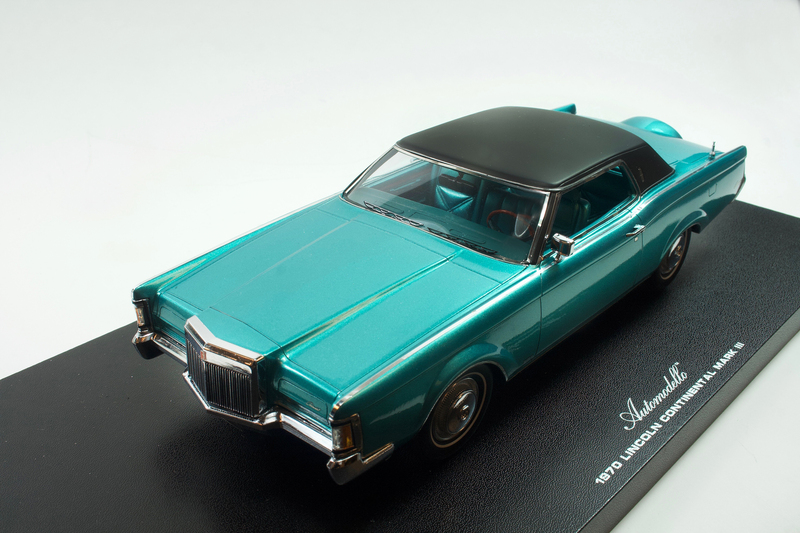 Well, Automodello is rolling out its latest 1/24 scale model, a brilliant 1970 Lincoln Continental Mark III, which follows its 1971 version released several years back. That one was sharp, but I like this model even better. I can still remember the first time I saw a Buick Riviera. As a kid, I was wowed. Its sleek lines, the headlights canted forward to make it look fast and sporty. There was just something about it that oozed elegance and class, and a bit of speed too! 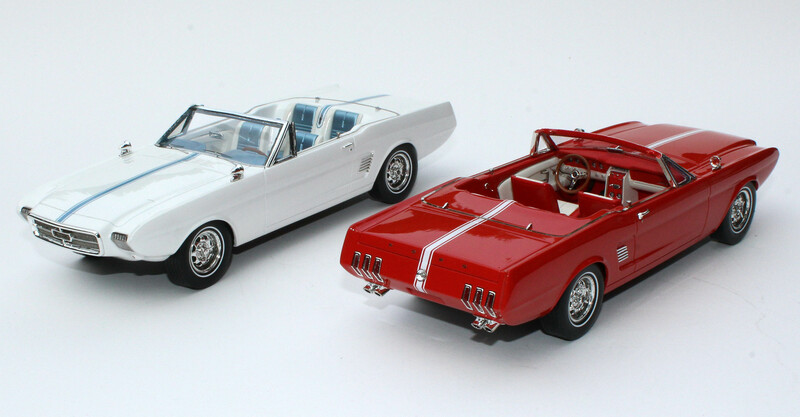 Automodello brings us a bevy of new 1965 Riviera Gran Sport models to fulfill any collector’s fantasies about owning one. 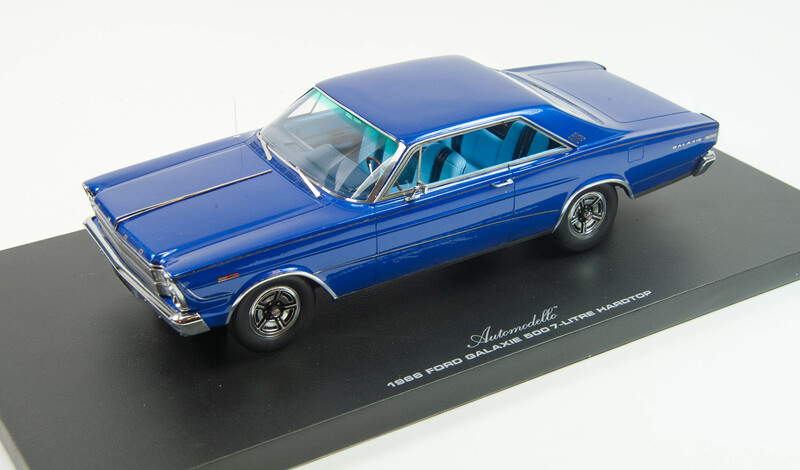 These are 1/24 scale resin models that continue Automodello’s tradition of creating beautifully finished models that fit well in any plastic car modeler’s collection. Like variety? Automodello delivers the Riviera in seven colors and in various quantities, from the snazzy Astro Blue with 299 models made, to the Enthusiasts Editions in Arctic White, Flame Red with black top and interior, and Burgundy Mist with black interior. Just 19 will be made of each Enthusiasts Edition. As a kid I saw a lot of Ford Galaxies around the neighborhood and some of my northern Indiana relatives who farmed had them and weren’t afraid to run them out in a cornfield if necessary. But rarer was the Galaxie 500 7-Liter Hardtop, a luxury model that wasn’t afraid to lay a little rubber at a stoplight. That’s the cast resin model Automodello reproduces in popular 1/24 scale and paints up in a variety of historically accurate colors. While the Galaxie 500 debuted in 1965 it was the 1966 model that boasted a new 7-liter V8. This was Ford’s already powerful 390 V8 but enlarged to 428 cu.in. to create a real torque monster. Unlike the earlier 390 model this one could accommodate all the luxury options Ford packed onto its Galaxie 500 models to push them from standard family cars to luxury models. So in addition to performance type power, the 1966 models had power steering, power brakes, and air conditioning. The 7-liter also could be coupled with an automatic transmission, something the earlier Ford 427 V8 designed for NASCAR use, could not. There have been some fine luxury cars made in the United States, exemplary machines that set the auto world on its proverbial ear. Pierce-Arrow, Packard, Duesenberg, Auburn and Cadillac come to mind. Only Cadillac is left, but that’s because GM kept it alive through the Great Depression when it was churning out some fantastic cars and engines in a weak market. 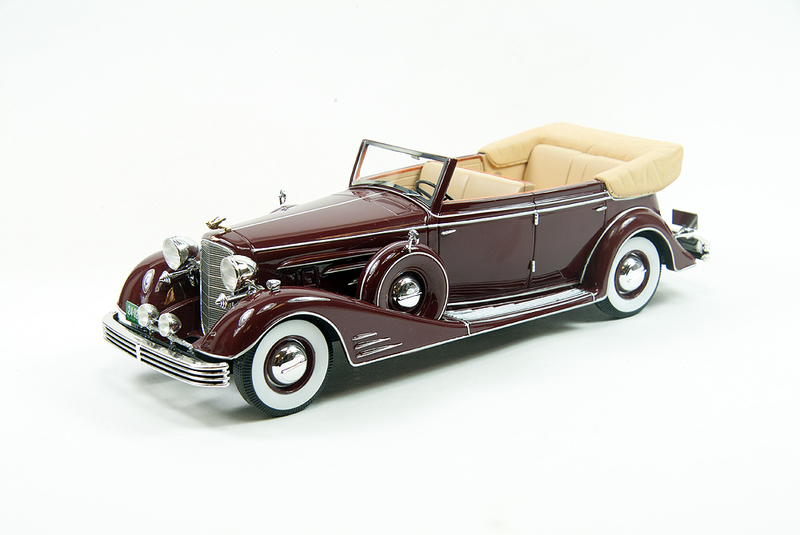 One model sums up the strong Cadillac effort of that era, its V-16 powered Fleetwood All-Weather Phaeton. Oh baby, this was a monster with a 149-inch wheelbase. That would make the current Cadillac Escalade SUV look like a mid-size vehicle as the Fleetwood base was 33 inches longer than an Escalade. 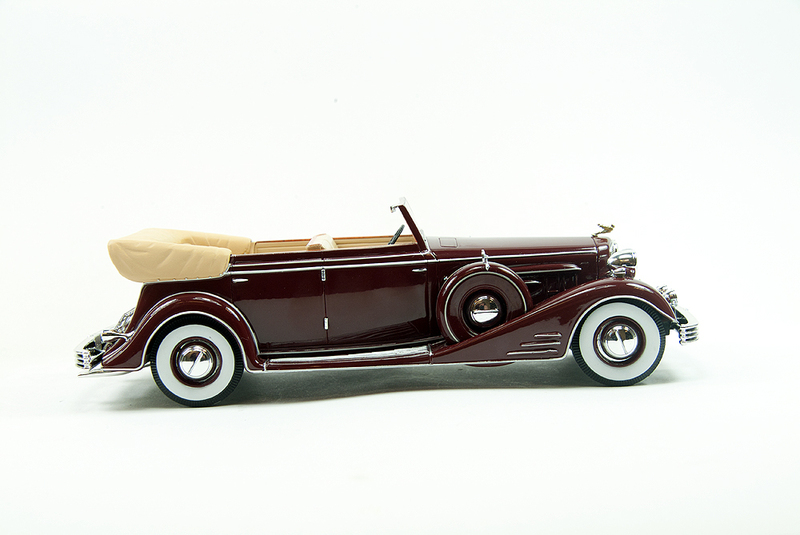 Now NEO has created this elegant drop-top in 1/24 scale resin, and it’s a deep red beauty. The Fleetwood’s V-16 was new in 1930 and surprised the automotive world that thought the V-12 was the way to go. Caddy created an overhead valve 452 cu.in. V-16 that created 185 horsepower. It was linked it to a 3-speed synchromesh transmission, another Cadillac invention. Cadillac kept pushing too, following in 1931 with a similar new V-12. If you do something well, it often behooves you to repeat what you did. 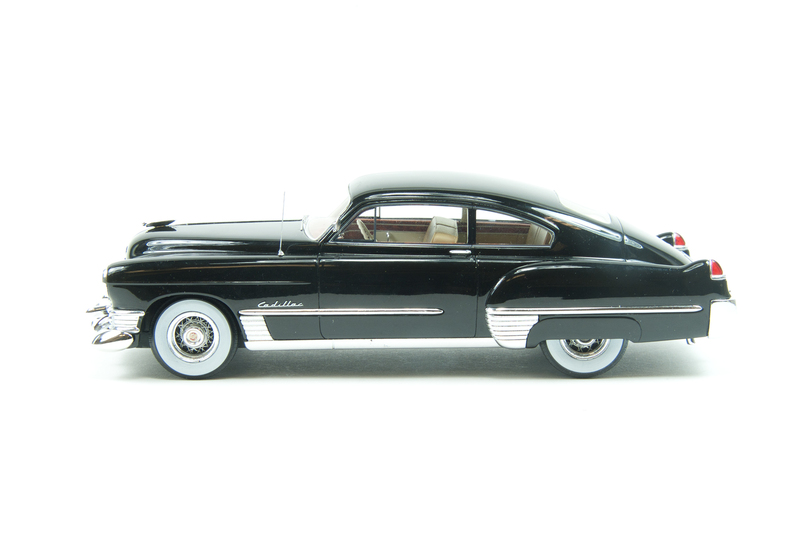 NEO knows that and creates a new 1949 Cadillac Series 62 Club Coupe, this time in 1:24 scale. 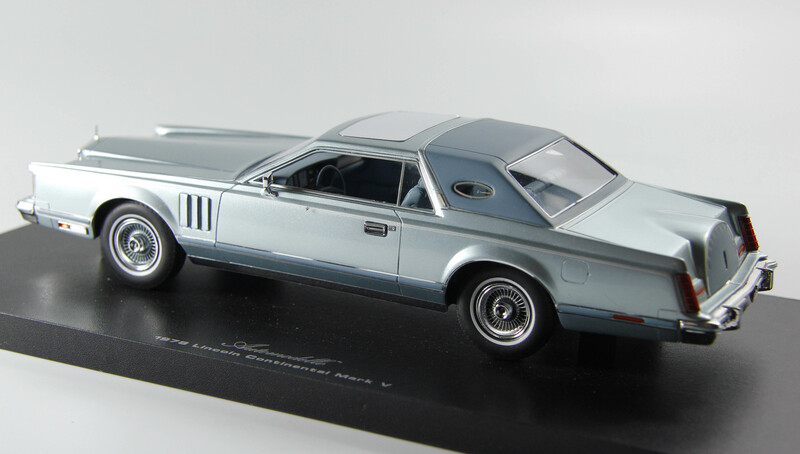 As with its previous 1:18 scale version, this Club Coupe is a car with presence, class and substance, just a tad smaller. The real one also was a sales standout for Cadillac as the brand fought to re-establish itself after World War II. 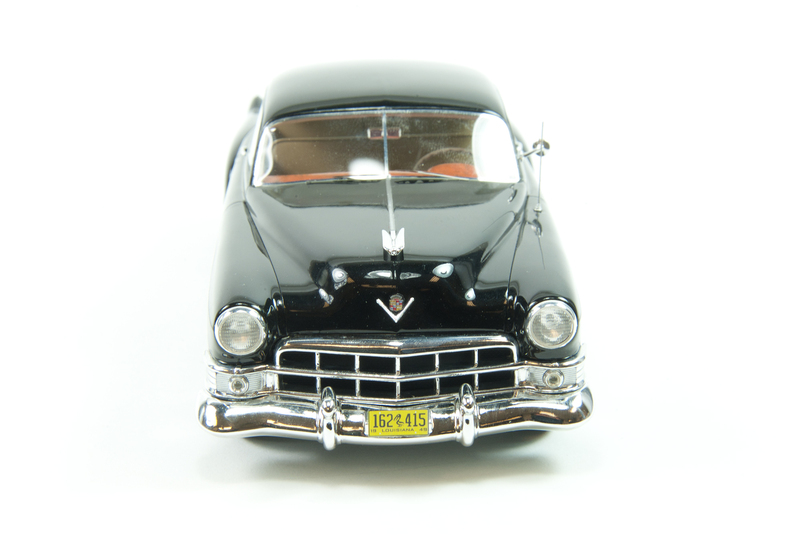 This black resin beauty continues the detail NEO brought to its earlier model, but in the smaller scale so popular with plastic car model builders. Both Cadillacs are distributed by American-Excellence, which supplied our review model. In case you missed our Scale Auto DC review of that model, here’s a refresher.